Our Special Way of Saying . . . Thank you! We have arranged for our audience to get special discounts at some of our local restaurants. 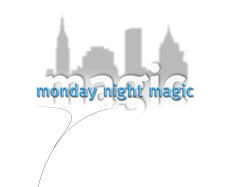 Mention Monday Night Magic and Receive A Discount! This offer is only available on the evening of the show. Here's how it works! Come to the Theater anytime after 6:30 PM, pick up your ticket for the show. Go to any of the restaurants below; show them your tickets and enjoy your meal at a discount. ** Evening of The Show ONLY!